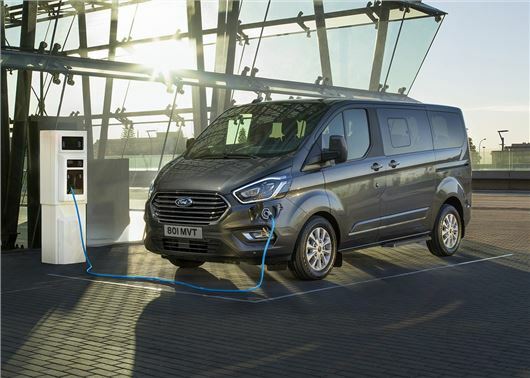 The Ford Tourneo Custom MPV is getting the zero emissions treatment, with the introduction of a plug-in petrol hybrid system that'll return 80+mpg and cover 31-miles on electricity. Ford hasn't released any prices for the 2019 plug-in petrol hybrid Tourneo Custom, but we expect the large people mover to cost significantly more than the £35,285 needed (before VAT) for the range-topping 170PS Tourneo Custom Sport 2.0-litre diesel. However, while the new Tourneo Custom won't be cheap to buy or lease, it should provide low running costs. Fuel-efficiency and CO2 emissions are still awaiting official homologation, but Ford has indicated that its van-based MPV will return 85mpg and 75g/km of CO2. The front-wheel drive eight seater uses an electric motor that's powered by a lithium-ion battery pack (located under the passenger floor) and a 1.0‑litre 'range extender' EcoBoost petrol engine. The van can be recharged in six hours from a domestic 240V 10-amp power supply or three hours via a 240V 16-amp or 32-amp supply. Regenerative braking and selectable driving moves will also preserve or top-up the battery while the van is on the move. Available as an eight-seater in Titanium spec only, the Tourneo Custom plug-in petrol hybrid gets the latest SYNC3 touch and voice activated infotainment system, with Apple CarPlay and Android Auto compatibility. Active park assist is also offered, which helps steer the van in and out of parking spaces, while the driver controls acceleration and braking.